NBC 6's Johnny Archer has more as the event debuts at its new home after three decades on Key Biscayne. The new site for the Miami Open suddenly is missing a lot of star power. Serena Williams withdrew Saturday, blaming a previously undisclosed left knee injury. Less than two hours later, top-ranked Naomi Osaka lost in the third round to tour veteran Hsieh Su-Wei of Taiwan, 4-6, 7-6 (4), 6-3. Osaka's departure matched the earliest ever in the tournament by a top-seeded woman and jeopardized her No. 1 ranking, depending on results next week. "I feel like I've dealt with the stress of people asking me do I have pressure because I have the No. 1 next to my name," Osaka said. "I thought I was doing fine with that, but I guess I'm not." "Radu put me through the ringer," Federer said. Williams' withdrawal was unexpected because she showed no signs of injury a day earlier while winning her opening match against Rebecca Peterson, 6-3, 1-6, 6-1. Williams didn't mention any health issues during a news conference after the match, and the WTA had no information regarding when she was hurt. Williams' victory Friday was her first at Hard Rock Stadium, the Miami Dolphins' home and the Miami Open's new center court. The tournament moved this year from Key Biscayne, where Williams won eight titles. "I am disappointed to withdraw," she said in a statement. "It was an amazing experience to play at Hard Rock Stadium this year, and I would like to thank the Miami Open for putting on an amazing event. I hope to be back next year to play at this one-of-a-kind tournament in front of the incredible fans here in Miami." 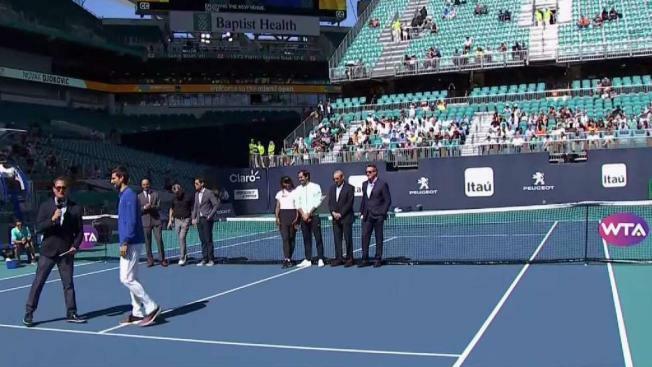 Federer, a three-time champion, lost serve only once — in the first game — but was on the ropes until he swept the final three games, to the relief of an enthusiastic stadium crowd. "It was a great atmosphere," Federer said. "It was electric. I think that's why I played so well at the end." While attendance in the stadium continued to be spotty, outer courts were jammed, and the day session drew a tournament record 32,831 spectators. Seeded losers on the men's side included No. 10 Karen Khachanov, No. 21 Diego Schwartzman, No. 26 Guido Pella, No. 30 Stan Wawrinka and No. 31 Steve Johnson. In a game of inches, the 5-foot-6 Schwartzman lost to 6-foot-11 Reilly Opelka 6-4, 3-6, 6-4. Williams was next scheduled to play No. 18-seeded Qiang Wang, who advanced to the fourth round. Also reaching the women's round of 16 was the 33-year-old Hsieh, who turned pro in 2001 but has achieved the two biggest victories of her career in the past nine months. Her only other win over a No. 1 player came against Simona Halep at Wimbledon last year. Osaka smiled when reminded it was the first time in 64 matches she lost after winning the first set. "I know — it's depressing," she said. "I was thinking about it right after I lost." Osaka, 21, has won the past two Grand Slam tournaments. Williams, 37, still hasn't won a tournament since the 2017 Australian Open, before she took a break of more than a year to become a mom. She has played only eight matches this year. Williams' stay at the Miami Open was also brief last year, when she lost in the first round to Osaka. Friday's match was Williams' first since she retired from Indian Wells two weeks ago because of a viral illness. "We wish Serena a speedy recovery and hope to see her back in Miami next year," the Miami Open wrote on Twitter. Williams was honored for the fifth time as the Associated Press' Female Athlete of the Year in 2018 after a remarkable year in which she returned to tennis despite a career-threatening health scare after childbirth in 2017.